You don’t have authorization to view this page. You don’t have permission to access PayPal.com on this server. Attempt to reload or refresh the web page returns the same 403 forbidden access error. 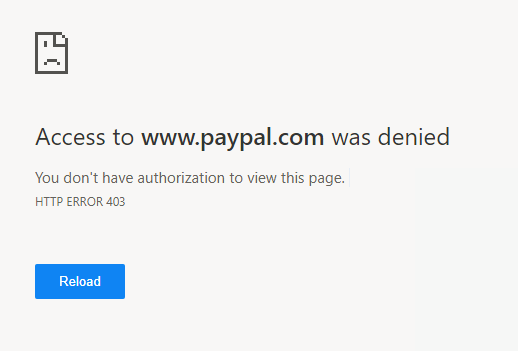 The access denied to PayPal website is usually related to issue with ISP (Internet service provider), especially related to the IP address that is currently assigned to your Internet connection, which may have blacklisted by PayPal. To fix the issue and regain access to PayPal, try to turn off or unplug the Internet modem or router (which provides the connectivity to Internet from ISP), and leave the Internet disconnected for a few minutes. Then, re-turn on or plug in the box, hoping that you’re assigned a new IP address by the ISP which is not banned by PayPal, and thus able to access the PayPal account.